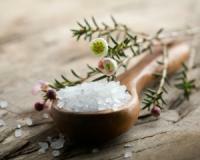 Epsom salt is the latest health and beauty must-have! What do bath salts, hair volumisers, foot spas and tile cleaners all have in common? They can all be created in an eco-friendly way using Epsom salt! So what exactly is Epsom salt? The salt well-known for its detoxifying benefits packs loads of magnesium and sulphate, two essential minerals. It's also a natural anti-inflammation remedy and gentle exfoliant that's great for soothing sore muscles, treating dry skin and speeding up the healing of small wounds. Read on for four budget-friendly, fuss-free ways that the Epsom Salt Council recommends you use Epsom salt to stay healthy and looking beautiful in the comfort of your own home. Do you struggle with dry or chapped lips and always find yourself fumbling for lip balm? To give your lips a deep treatment using Epsom salt, combine a few tablespoons of the salt with Vaseline then apply the mixture to your lips and gently rub it in. The solution will slough off any dead skin cells and leave your pout looking healthier. Because Epsom salt has natural anti-inflammatory properties, it’s a great remedy for treating mild to moderate sunburn irritation. Simply mix two tablespoons of Epsom salt with one cup of water in a spray bottle and then spritz onto the affected area. You can consider your days of dealing with messy aloe, over! Kiss sore muscles after exercise goodbye! Create a muscle-soothing paste by dissolving one teaspoon of Epsom salt into one cup of piping hot water and cooling the solution in your fridge for half an hour. Be sure to clean and dry the affected skin area before you apply the paste. To alleviate redness, sting and irritation caused by common insect bites, mix two tablespoons of Epsom salt with one cup of water then dip a cotton washcloth in the solution and apply gently to the affected area. You can find Epsom salt at most supermarkets and health stores. Six tips to step up your bath game to soothe itchy skin, relieve pain, fend off a cold and more! This vitamin-rich remedy can replace your entire skincare routine!